The Japanese are breaking international treaties in the Antarctic the New Zealand and Australian governments are not happy with this and I don’t blame them. Why should this (in my opinion) barbaric race of people decide they need whale flesh for research when the whole world knows it is sold in the shops or stores bistros etc as a food. Think back you WW2 veterans if you were captured by this mob in those days you had to exist on measly scraps of rice thrown at you like dogs, their language in those far off days sounded liked guttural barks of command. These same people who lost (or did they) the war is now imposing on the western world again. We buy their cars computers and what have you but they are not content with that no sir. Now they are killing a harmless creature (could it be whales don’t fight back hmm) who just in the main hurts nobody and just eats plankton. 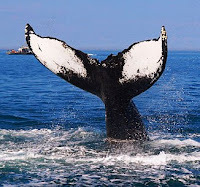 A good site for the history of whaling in Australia and when it ceased can be found here, I recommend it. It must be said that all these anti whaling protesters with their ships can endanger their lives and others at times; the bill for Australia to send a ship even only a customs vessel costs a considerable amount of money to the Aussie taxpayer (Paul Shepherd take note) at the same time I do admire them for their tenacity although I wonder at times if it is just a game to them. This idiot here has other ideas it seems he sounds like a Brit comparing whales eating precious ducks bloody clown. So yeah Cricket and I reckon that India are in the box seat tonight with day three coming up as I must say India put on a great batting display yesterday at stumps on the third day today we were still 204 runs behind a position Australia’s cricket team has not been in for some considerable years is the tide turning I wonder!! The batsmen who I thought starred really well were Sachin Tendulkar, Anil Kumble, Mathew Hayden and Punter Ponting; all bowlers really had to work hard for their wickets. Adam is a true sportsman who walks when he knows he is out not like most other batsmen, I applaud him for that. According to this news report the game is destined to become a draw. 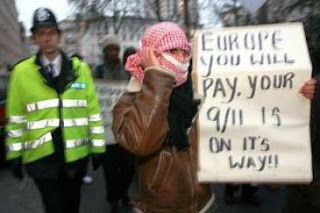 Why do we have to put up with these invaders from Islamic countries? Good question simply put our successive governments administrations call it what you will permitted it. What utter fools we all were and now sadly we are all paying the price and what's more we have raving lunatics like the American civil liberties union and like-minded unions in other western countries taking their side. The political correctness policy our administrations have permitted has gotten completely out of sync for what it was originally designed for. A simple answer to that one is we felt sorry for them living in the filthy conditions found in their own lands further more a lot were genuine refugees escaping terrorist regimes, we were just being humane. Look where it got us 9/11 the Bali bombings and many more all tainted with Islamic fundamentalists and their suicide bombers etc. 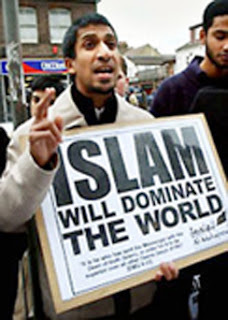 Look at this jerk could he do what he is doing in his own country, of course he could not it's just one more reason why he moved to a western country. Israel was a prime example of this thanks to the PLO and HAMAS; things seem to have quietened down there somewhat now thankfully. Meanwhile honest folk of Christian religious beliefs have to put up with this. I don’t know about you but I am heartily sick of em, a lot of us may not be good Christians but most of us were raised to be, besides it is your country and mine I am talking here not some crackpot Middle Eastern land. Swarthy bearded individuals who deny their women any rights in most cases; do we do that maybe but rarely, on the whole we are all equal today and I second that. A racist I’m not but when these people continue doing what they are doing I think a line has to be drawn here. Take note will you Harper, Rudd, Brown and Bush of all this. So why are they all still here are they better workers? Well in some cases that is possible and this brings up illegal immigrants rife in America; mainly from Mexico I won’t buy into that today, in any case it's none of my business. On the whole this is not the case I myself am sending a copy of this to my Prime Minister whether it will do any good is up to God’s will (note not Allah we speak English here just like the average American) I was prompted to some extent to write this by some images of some happenings in the Old Dart, they are not recent ones by the way, click on them to enlarge them. Thank goodness we have to get permits in most states to demonstrate, mind you that is mostly ignored. Now I do realise that most western countries are or were obliged to accept some refugees according to some UN statute. The United Nations is in my opinion a sick and sorry mob perhaps if they did the job correctly we may not have been in this sorry predicament today. The UN should enforce the peace not keep the peace, there is a big difference in construing this, remember taxpayer’s money from all countries in this weak organisation pay dues and pay their military to be part of a UN force in troubled areas of the globe. It’s about time we stopped and closed up shop not an easy thing to do sadly, we have left it rather late I fear; all of us have if we are honest none of our so called esteemed leaders have much foresight; we voted these clowns into power remember that. One solution is to vote them out of office once the chance rolls around again. Hopefully the next administration of the USA will take steps to remedy this situation but I doubt it very much. I imagine it will be much the same in my country, it’s said the pen is mightier than the sword but I have my doubts at times big ones at that. Obviously other European countries suffer the same problems. I sent a video to a friend in Arkansas the other day; I was assured by him that Americans should see it. Depicting mainly the US Military helping AND defending other peoples homeland from tyranny, so have a squizz it's worth looking at. Is anyone grateful Hmm I don’t think so, we also help in our way, help and aid is always forthcoming from Australia we mainly concentrate on our neighbours on the Pacific rim sadly we do not have the cash or resources the American government has else we obviously would help a lot more than we do. I recall certain governments hostile to America (and us) asking for aid when they suffered an earthquake; something like that anyway and as usual aircraft were or had been dispatched. This was the same country who embarrassed our allies remember Tehran I damn well do. 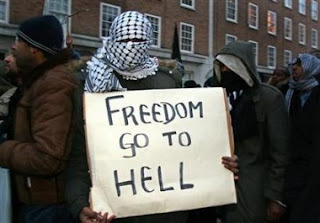 Conclusion WAKE UP AMERICA, AUSTRALIA, the UK and other coalition countries before it’s too late. Somehow I rather think it is. Comments most welcome where are you Bin Laden. It is my opinion that the decision (or is it a decision) to send a Customs vessel to pick up the protestors of the Japanese whaling fleet is a bloody piss poor effort on the part of the new Australian government even though the previous government kowtowed to the Japanese also. Get your finger out Kev old mate and do the job you were elected to do. Looked at interest rates lately have you? Nah course not too busy signing the Kyoto protocol. Dishing big hand outs to the state premiers as well. You’ve had enough time now to assimilate yourself into the nation’s top job. Now these whalers kick em out send a couple of warships not a bloody customs vessel you are making us the laughing stock of the world. Do you recall the war in the Pacific? I thought not well these jokers do not need whales for research they eat whales. They nearly beat us in WW2 never forget them apples so finger out and make sailing orders pronto. In my opinion, the Indian team are and although I want Australia to win, it must be done in a fair contest. I can hear the wowsers now saying but this is the twenty first century not the eighteenth. So what: rules are rules and should be adhered to and the game must be played in the spirit of the game, at the moment it's not. After watching the second test match between India and Australia I thought the umpiring a bloody disgrace. A noted batsman/bowler Andrew Symonds blatantly admitted to being out twice; he was too I saw it. He was not the only one the umpires well I have no words really to describe them needless to say two of them have been dropped for the test match in Perth. The video umpire needs a kick up the backside as well in my opinion. Full marks must go to Sachin Tendulkar India’s hero with his magnificent score. The racial remarks on the field of play must be stamped out at once and it’s no use Australian players denying it let’s face it they have been doing it for years and the sledging that goes on is unreal. Harbhajan Singh was singled out in my view with his so-called racial remarks to Andrew Symonds (not that he did not have cause to as he did), because he is a very fine spin bowler and was taking too many wickets. Outcome of this; he was suspended for three matches The India team arrived in Canberra yesterday for a match against an ACT Invitational eleven, hoping to put the past week behind them and resume playing. The tour was suspended for two days when the Board of Control for Cricket in India ordered the players to remain in Sydney in protest at the three-match ban imposed on the spinner Harbhajan Singh for allegedly making a racist remark to the Australian all-rounder Andrew Symonds. A quote from John Bertram "John Bertrand, a sailor who won the America's Cup in 1983, who is the chairman of the Sport Australia Hall of Fame wants a meeting with Cricket Australia to demand that the players show more respect to opponents. Unquote" he is certainly right in that. Ok we play hard and fast as any team should but this goes beyond the pale; look back in your history Australian cricketers and think about the famous bodyline that the old Dart dished out to us who whinged then we did forgotten that have you yeah I figured that. Thanks to a friend in the USA (I won’t mention her name without permission) I have just only found out about this and by cripes its free you can up grade it though and I shall do so no risk. It comes out as a flash product from any images you upload whether they are from your own personal computer or on an image site; I reckon it’s a top idea. I will find out tomorrow after good nights sleep. Meanwhile enjoy the test flight I made. Today on the Sunshine coast it averaged out at 40 millimetres it has been like that for a good ten days I think as it was raining prior to Christmas day the temperature is not average by any means and folk will possibly smile in the Northern Hemisphere but folk here although the average Temperature is (25C approximately) it feels cold to us especially older folk. 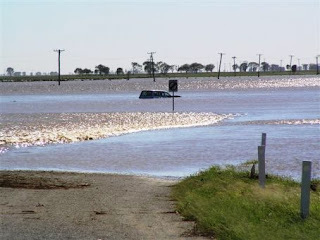 The rest of Australia seems to be enjoying hot weather lucky them although they need rain also. 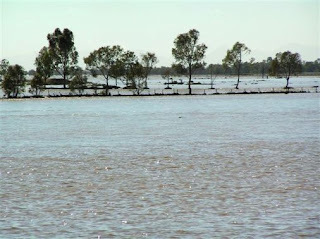 A friend of mine in Coonamble NSW in her weather report told me it was hot and they have just gone through some very bad flooding there. Here are a couple of images she sent me I did receive more but these appeared the worse well I thought so. At least the weather in Sydney was fine so the cricket test between India and Australia continued; surprisingly we scored a large total in the first innings despite being on the ropes with a pitiful score from some of our top batsmen. India lost 3 wickets for 192 by stumps tonight. With 3 more days to go I am putting my money on Australia still I would I guess? I thought the umpiring bad as in my opinion Symonds was out at least twice and the commentators agreed with me. There is now the usual argument raging as to why he did not walk as he knew he was out. In a nut shell cricket is no longer the Gentleman’s game it once was.